“Nothing that is ever great in this world gets done rationally.” So says Stefan Pokorny, principal subject of The Dwarvenaut, the inspiring and highly entertaining new documentary from Josh Bishop (Made in Japan). Certainly, one may disagree with Pokorny’s statement, but after watching his life story unfold over the brisk 83 minutes of the film, one can understand why he feels that way. Born in the 1960s from a liaison between a Korean mother and an American G.I., Pokorny was shunted off to the United States where after one failed adoption he was finally claimed by a loving couple, a pair of immigrants, themselves: the mother was Italian and the father Czech. Raised in New York by his intellectual parents, Pokorny somehow became a bit of a street brawler and school dropout before finding his vocation as an artist and role-play gamer, eventually combining both passions when he founded his company, Dwarven Forge. As much as this is a portrait of the artist as a middle-aged man, this is also a love poem to the original role-playing game Dungeons & Dragons and the creative community of slightly nerdy fans that it is has nurtured over the years. When we first meet Pokorny, he is leading a game session as its “dungeon master.” Even for folks who may never have played – or perhaps even heard of – the game, it is clear from the opening how much fun it can be for its participants. Dressed in medieval costumes and sitting around a table filled with a jaw-droppingly detailed model village, Pokorny and his friends clearly know how to have a good time. We soon learn that the model, itself, was built by Pokorny and Dwarven Forge. With a compulsive attention to arcane minutiae, these good folks produce what are considered (according to other gamers at places like GaryCon and IndyCon, interviewed in the movie) the best models and figures in the business. And it’s not exactly small-time business, either. The dramatic spine of The Dwarvenaut centers on Dwarven Forge’s third Kickstarter campaign to raise $2 million for a full-scale city (backstory included). If this seems like a lot of money for what some might consider toys, then one has missed the point. For the movie is about much more than the game or the business. It’s about the immortality of art and the joy in pursuing one’s lifelong passion. Like Raiders! 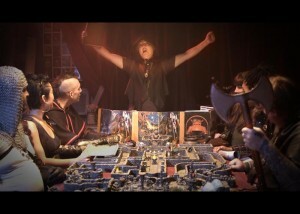 : The Story of the Greatest Fan Film Ever Made, which played at last year’s SXSW Festival, The Dwarvenaut is a testament to the value of childhood dreams in later life. Both movies celebrate the power of imagination, and the delights of geekdom. Unfortunately for Pokorny, The Dwarvenaut also reveals his ongoing (high-functioning) alcoholism, and while he might feel as if such vices come with the artistic territory, Bishop’s inclusion of many shots of drinking constantly remind us of the potential pitfalls ahead. Pokorny is such an engaging and charismatic character that we can only hope that it doesn’t get the better of him (good luck with that). Here’s hoping for many long years for him and Dwarven Forge!